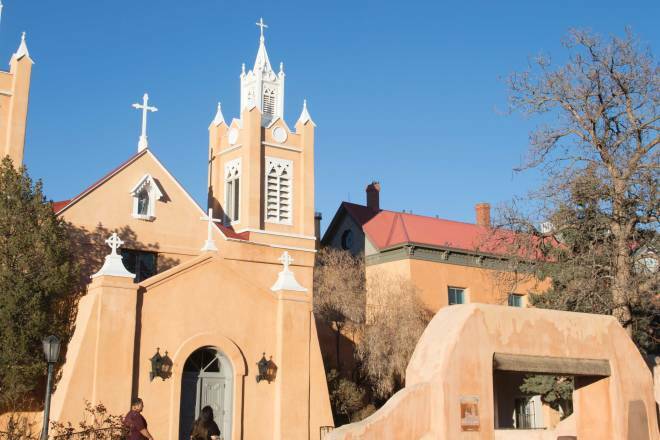 Above: Old Town&apos;s San Felipe de Neri Church was built in 1793, replacing a 1706 mission. On the edge of a neighborhood epitomized by rambling adobes, turquoise doors, and ristra-hung portals, Hotel Chaco’s stone edifice stands as the star of Old Town’s new era. As the first newly built hotel in 40 years opens this month, it joins a handful of new shops, restaurants, and galleries that beckon even longtime residents to re-explore the city’s founding neighborhood. The hotel is part of the Heritage Hotels & Resorts group, which boasts nine statewide properties that exude local culture. (One, Hotel Albuquerque, is adjacent and will share a pool with its baby sister.) Hotel Chaco’s bona fides promise to deliver contemporary luxury with an only-in-NM vibe. Global architecture firm Gensler and Heritage designer Kris Lajeskie imagined it to evoke the spirit of Chaco Culture National Historical Park—from cascading doorways that suggest those at Pueblo Bonito to natural materials that could have been lifted out of the northwest New Mexico ancestral site. Guest rooms are grounded in wood, stone, and natural fibers, yet are entirely of the moment, with sleek furnishings, smart TVs, and state-of-the-art connectivity. The Two Gray Hills/Toadlena Navajo weavings in guest rooms reflect the hotel’s vast Native American art collection, which also includes works by Roxanne Swentzell, Joe Cajero, Patricia Michaels, Tony Abeyta, and Rhett Lynch. The hotel’s restaurant tops off the experience—literally. With a menu developed by chef Mark Miller, formerly of Santa Fe’s Coyote Cafe, Level 5 perches on the hotel’s top story, opening onto panoramic views of the Sandía Mountains, bustling Old Town, and the emerging Sawmill District below. Here’s what’s new in Old Town, all within walking distance of Hotel Chaco. With locations in Ruidoso and Cloudcroft, Old Barrel Tea Company expanded to Albuquerque in November with a, well, barrelful of tea-drinking accoutrements: cups, pots, and loose-leaf teas. House-mixed blends have New Mexican flair, including the Mexican Hot Chocolate tea with Hatch red chile, Horchata Rooibos tea, and Dulces Sueños sleepy tea. A trio of Huffmons—Paola, mother Dana, and sister-in-law Bailey—co-own the country-chic shop and created the recipes. Once a month they host PilaTeas, blending a Pilates class with cups of tea—perhaps sweetened with the variety of raw, unfiltered honeys also available there. Old Town is known for traditional fine art that befits its 300-year history, but Ghostwolf Gallery arrived a year ago to display something “distinctively different,” according to owner Amy M. Ditto. The photographer/painter/portraitist has exhibited her work at the Hubbard Museum of the American West in Ruidoso and is the featured artist of the 2016–17 Placitas Artists Series. For three years, she showed her paintings at an Old Town gallery, but felt she hadn’t found a stylistic fit for her vibrant takes on Southwest landscapes and iconography. She founded Ghostwolf to display her work and that of a dozen fellow artists who create everything from pop art featuring Frida Kahlo to fantastical illustrations. Although he first envisioned Guerrilla Graphix as a political art gallery, designer/owner Travis Parkin soon found that most people didn’t want to wear their partisan notions on a T-shirt. They did, however, want to display their New Mexico pride. After moving to Old Town in 2011 (following a three-year run in Nob Hill), Guerrilla Graphix has specialized in offbeat apparel, coffee cups, and magnets not found in most souvenir shops. “Our stuff is edgy, but still has broad appeal. It’s relevant,” Parkin says. The emporium’s original designs tout local pop-cultural references—from Heisenberg’s face rendered as a Día de Los Muertos sugar skull to Blake’s Lotaburger logo-wear. “Sometimes it praises New Mexico. Sometimes it pokes fun at New Mexico, but never in a mean way,” he says. Although a must-see for visitors, Old Town often falls off locals’ radar. Velvet Coffeehouse owner Greg Smith opened his café expressly to give residents a reason to roam back. A Gen-Xer who has “done a bit of everything,” the former sous-chef was inspired by specialty coffee shops in New York and Los Angeles when he opened Velvet on Christmas Eve 2015. “We just make a great cup of coffee,” he says of his shop, which pulls beans from Santa Fe–based Iconik Coffee Roasters. Smith makes all his syrups in-house, including those for seasonal specialties like winter’s Mexican mocha with cinnamon and red chile, and summer’s sparkling lemonades with rosemary or thyme. Smith envisions the shop’s green-upholstered benches and patio tables as the quintessential “third space,” where locals and tourists can mingle over a cup of coffee and perhaps an in-house cheese Danish made with cranberry, orange, and sage. The Albuquerque Lumber Company long anchored the fittingly named Sawmill District on the north edge of Old Town and just a block down Bellamah Avenue from Hotel Chaco. Long an industrial neighborhood, Sawmill is emerging as one of the city’s most vibrant areas. The Sawmill Community Land Trust has ushered in more than 250 housing units—including apartments and live/work lofts geared toward artists. Ponderosa Brewing, with approachable craft beers and pub-style food, and Prismatic Coffee, riding the craft-coffee wave with pour-over brews, have popped up in the mixed-use developments. These early adopters will soon have company. Plans are under way for the Sawmill Market, a massive food arcade and restaurant destination reminiscent of San Francisco’s Ferry Building Marketplace. The National Institute of Flamenco has expressed interest in locating its permanent facility—which would include class and office spaces—in the neighborhood, placing it at the intersection of local and tourist activities.